This gig is EXACTLY what I wanted to hear. Hot Damn. Set opens with about 50min of trio bliss … the band explores some open space for the first 5min or so, seeming like they are on the brink of developing more of a groove but the sound resists … then Billy and John pull back and Chris emerges with this stellar acoustic bassline, the other two join in and this works into an incredible melodic improvisation – wow! This Improv moves for almost 10min before the trio breaks the sound down again into some Open Improv and minor Bass’n’Drums interplay — all pretty loose for the next few minutes … and then again, Chris gets us going on our way towards a more cohesive groove and by the time we reach 22min into this set these guys are just ROCKIN’! Then again, the mood simmers down and we’re treated to further open exploration although with a bit of a pulsing beat that Medeski tinkers over with an electric piano sound … Chris is bowing an odd little repetition … illyB is playing around with some of his toolbox toys … John closes this out with some trills then hits a heavy organ chord to begin the next Improv development with Chris jumping right on top of Medeski’s sound, but Wood has moved to the Hofner and is doing some of that awesome pick work we hear on a number of tunes, but he’s flying free here on top of the keys for a while before Medeski adds another sound to the mix — it’s 2min before illyB kicks in a beat on the kit and Chris opens up his playing to be a bit more groovy and interactive, John finds a melody (from where? Where do these sounds come from?!? ), and they’ve now spontaneously created yet another incredible piece of music … and we’re only 30min into a set lasting 1hr 47min … oh these sweet sounds! The entrance of Marc Ribot, guitar god extraordinaire! Ribot enters for track #2 of the recording and remains until the end of the set — so we get almost an hour of Ribot w/ MMW which is just the best. 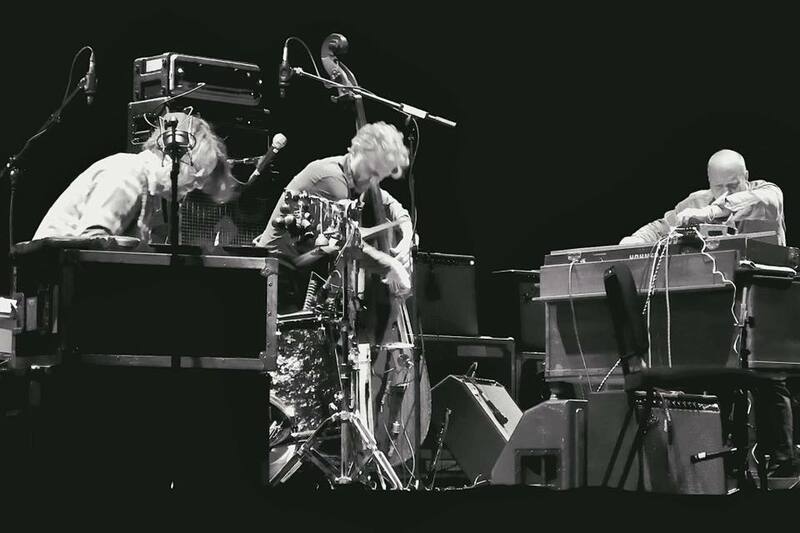 The guitar emerges through a caucophony of sound building out of that last Improv and as the track time moves towards 2min the sound settles down a bit, the trio establish a groove and Ribot begins to find his place in this spontaneous composition being developed. I think these 10min or so when the groove begins to the end of the track work into a single piece of music the quartet has created. 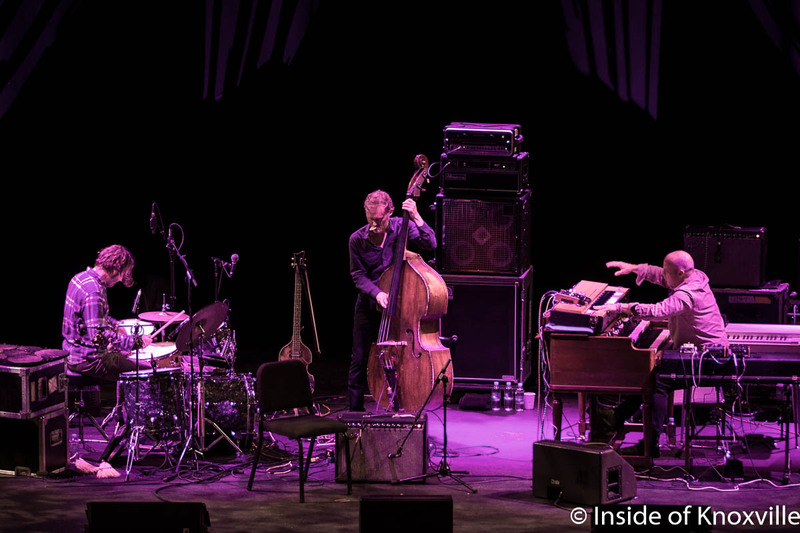 When Ned Rothenberg enters, everyone opens up to give him space without giving up their input — this gets almost tribal sounding over the Open Improv that welcomes Ned and his bass clarinet to the stage. A groove settles out of the drums-heavy opening with everyone connecting and just a real nice vibe here … 5min later the pace picks up as a new Improv develops — Chris is very much leading the affairs this evening, at least to my ears, being the strongest voice with everyone reacting mostly to his playing (most often it’s Medeski that fills this role, I think, and not that Chris doesn’t ever step up but it just seems even more so over this set). Ribot really steps up at this point too, and this “tune” builds to a wonderful crescendo — Ribot is just wailing around the 15min mark and keeps pushing and pushing over the next couple minutes! 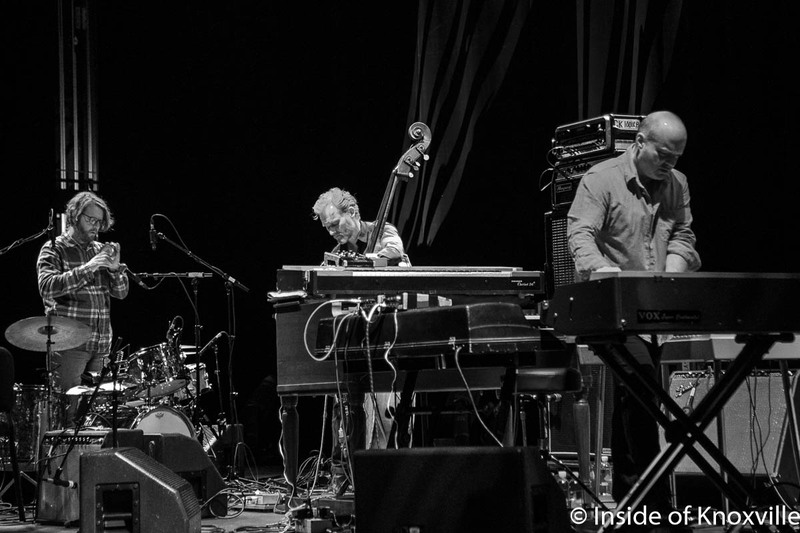 Medeski and Rothenberg are each wailing as well with Martin & Wood pushing the underlying rhythm more and more — BOOM! This explodes into more caucophony for a moment before settling into an eerie and wonderful interplay of the basses on stage: Stand-up and Clarinet. 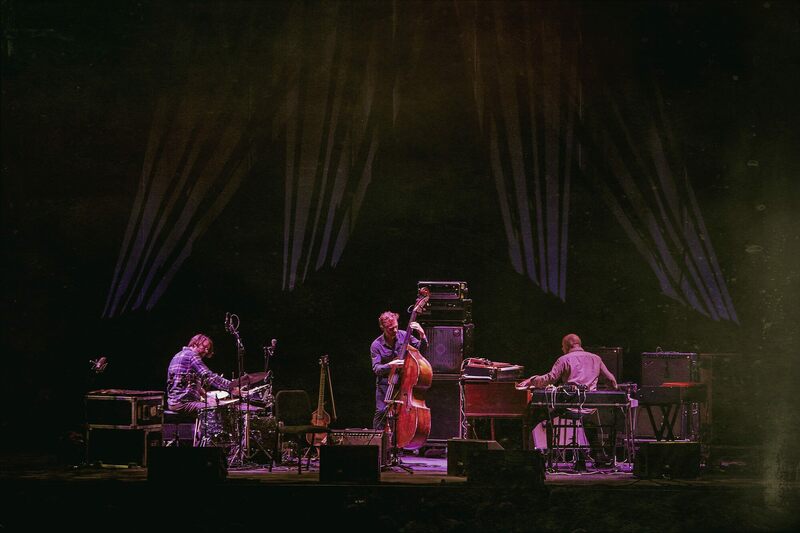 Wood and Ned sound like they’re having a lot of fun, with Chris beginning the exchange bowing his bass and Ned soloing over these sounds. Chris gradually moves into some finger plucking via some percussive beating of his wood, and Ned keeps reacting to Chris and Chris to Ned — check it out! As the two settle into a plodding interplay, illyB joins on the kit with a sparse beat, John and Marc add some chordal sounds and the creation continues to rise up in energy as we hit 22min in the track. The Improv gets more and more heavy — Billy is really beating those damn drums in this set and I dig it! He’s joining into that “bass” sound that is permeating the stage … oh yeah, this is a HEAVY THICK wall of sound from the quintet as we approach 25min — and there’s Ribot calling out above the thick bed! The build is peaking and peaking! After the sound hits the blind hill and comes down the quintet slides into yet another Nocturne-ish sounding Improv — this will take us towards the song the sound almost seems to have been moving towards all night. I love it when these Improv heavy sets seem to build into a song at the set’s end — it really ices the sound cake, if you know what I mean. And so we hit the familiar opening chord of Dracula – a perfect choice. Ribot always adds a delicious flavour to this track, and Rothenberg’s bass clarinet sound fits so well with Dracula’s vibe — just listen, you’ll love it. 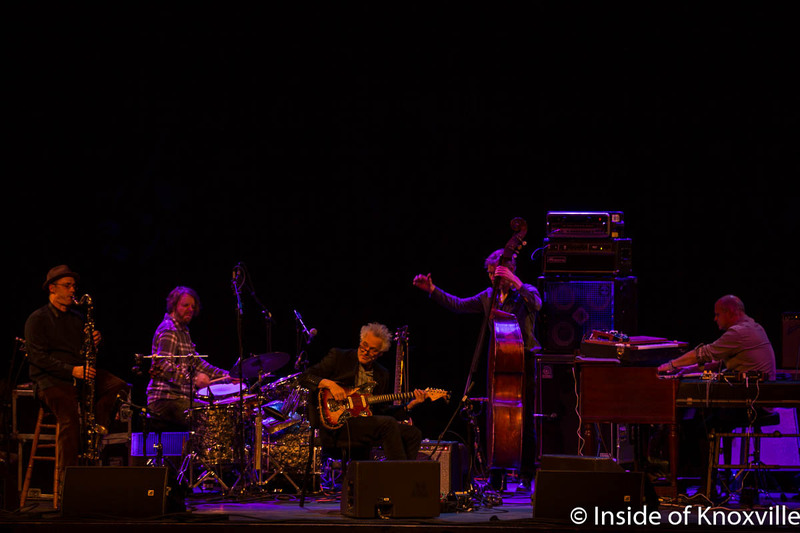 Posted on April 13, 2018, in FAITU, Jazz, Live Music, Music and tagged 2018, Big Ears Music Festival, Billy Martin, Chris Wood, FAITU, Friday Afternoon In The Universe, Improvisation, Jazz, John Medeski, Knoxville, Live Music, Marc Ribot, Medeski Martin & Wood, MMW, Ned Rothenberg, Stream Music, Tennessee, Tennessee Theatre, The Shack Project, TN. Bookmark the permalink. Comments Off on FAITU#51.